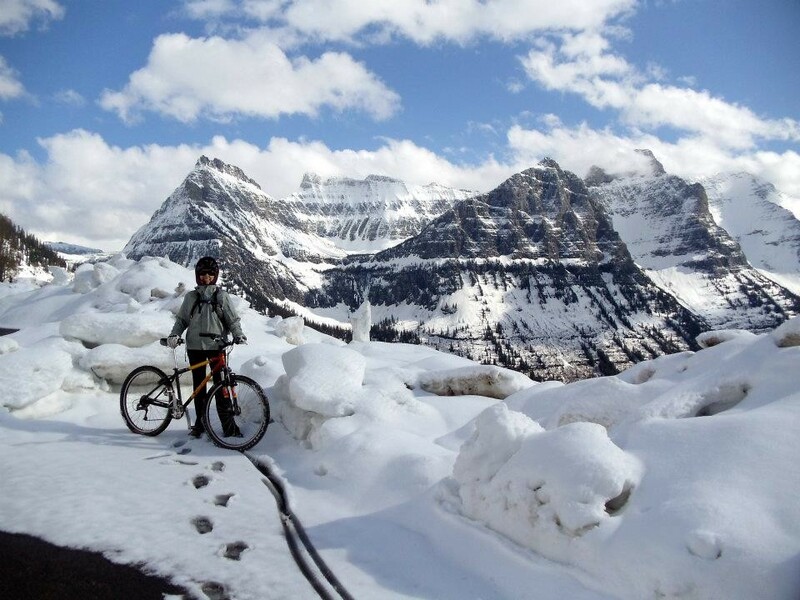 When the Going to the Sun Road in Glacier National Park is fully open from West to East, cyclists play second fiddle to cars and the Park’s famous red busses, called Jammers. During the peak Summer months, this famous scenic road is closed to bicyclists between 11 am and 4 pm. That means you have to set you’re alarm clock pretty darn early to make it up to Logan Pass and back down before 11 am. Others prefer to hit the “night shift” and start up in the evening after 4pm, others wait for a full moon and cycle up by moonlight. But, as the locals know, in the Spring time Cyclists have the road to themselves, save for a mountain goat that may wander in front of you (if you’re lucky) or a mama bear and her cubs scurrying up the hillside. Yesterday we cycled the Going-to-the Sun Road in Glacier National Park, and experienced just about every type of weather you can think of, rain, sleet, a bit of hail, wind and at times sunshine. We passed about 3 dozen other cyclists on our way from Lake McDonald to the Loop and about 3 miles beyond. Be prepared for any type of weather. It may look nice and sunny when you leave, but the weather can change quickly. A windbreaker type jacket is a must, even on a sunny day, as the high speeds you’ll hit on the way down will cool you down quickly. Bring a basic bicycle repair kit. If you get a flat tire and you’ve got no way to fix it, you’re out of luck. You’ll be hoofing back to your car. We ran into a stretch of unpaved road from Avalanche campground for a couple of miles, so you never know. A puncture could really ruin your day if you’re not prepared. That being said, make sure you check that your bike is in good working order, especially your brakes! You’ll be glad you did as you speed down the road on your way back. Bring water and snacks. During the Spring don’t count on Park concessions being open, so if you want to not give into your growling stomach and turn around early, throw in a granola bar or two into your bag. Don’t forget your camera and have fun!